The saying goes, "If you can't stand the heat, stay out of the kitchen." Well, that never stopped David Jaffe. Not only is he in the proverbial kitchen, but he's going to be flipping the bird to the fire with both hands. 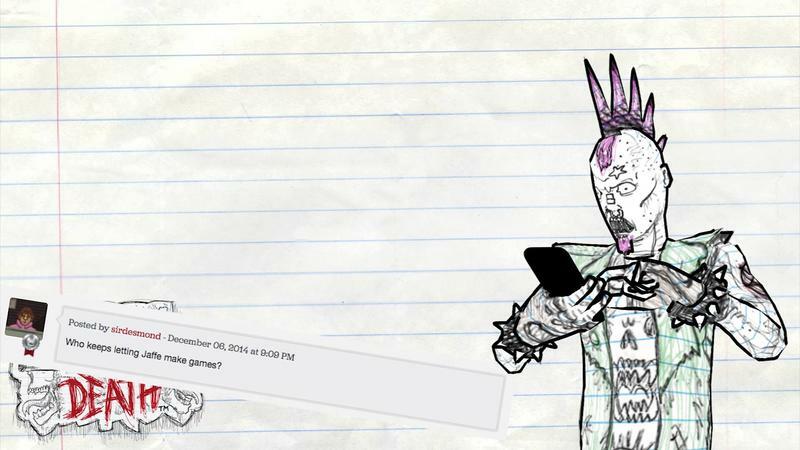 After the unveiling of his upcoming arena shooter, Drawn to Death, which is set in a high-school student's notebook, comments came in from all over questioning the game. My Twitter feed saw people questioning whether Jaffe might be the high school kid whose notebook these are from, if Jaffe might still be in high school himself, and other derisive comments from fan and critic like. In response to comments posted on Polygon and GiantBomb, Jaffe made the video above, calling out specific commenters and making a suggestion on what he thinks they can do in their free time (Hint, it's a swear). The tone of Drawn to Death isn't terribly surprising, considering Jaffe's legacy – God of War and Twisted Metal aren't exactly mature in the classic literature sense of the word. Whether this antagonistic approach to fan criticism will help or hurt buyer perception of the game remains to be seen, but I'm willing to bet that this isn't the last we'll see from Jaffe before the game releases.